Run About Trout Lodge was designed and constructed by a top Atlanta builder and has quality finishings throughout. The large designer kitchen has granite counters, stainless appliances, ten foot ceilings, a Keurig coffee maker and a Crock Pot. Features include a true dining room with large table, large vaulted great room with gorgeous floor to ceiling rock wood burning fireplace and SAT TV, powder room, and large first floor master bedroom with king size bed, SAT TV, French doors that open to a view of the Toccoa River, outdoor wood burning fireplace, and private hot tub which sets under a covered deck. The elegant master bath boasts designer cabinetry, jetted tub and lovely tiled separate shower. Upstairs you will find two oversized bedrooms, one with queen size bed and the other with two twin beds. The second bathroom has a jetted tub as well. The lower level has a game room with fireplace, SAT TV, board games and pull out sofa. Also, on the lower level is a bedroom with bunk beds and full bath. 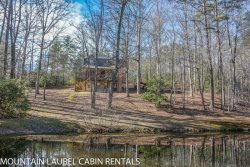 This cabin has 130 feet of frontage on the Toccoa River. Walk from cabin to river is approximately 100 yards. This section of the river is some of the best trout fishing in the area, and is stocked weekly with Rainbow and Brown Trout. Located beside the river you will find a pavilion with table. You will also enjoy the view of "The Blue Ridge Scenic Railway" as it runs behind the cabin! Run About Trout Lodge is conveniently located between Blue Ridge and McCaysville, and is the perfect romantic getaway, fishing retreat, or the perfect place to spend some quality time with friends and family. Nearby attractions include hiking the beautiful trails of North Georgia, biking, Antique Shopping, White Water Rafting, Horseback Riding, Scenic Train Rides and the famous Swan Drive In. All of our cabins include linens, dishes, pots, pans, towels, washcloths, etc... We will provide an initial supply of guest soaps, toilet paper, dishwasher detergent, paper towels and trash bags. We suggest that you bring your supplies for an extended stay of paper towels, trash bags, charcoal, and washing powders. This is the 3rd time I have rented from Mountain Laurel Cabins. Every time I have had an amazing experience. The cabins are clean and beautiful, the settings feel peaceful and safe and I will definitely be back again soon!! We had a family group and everyone had plenty of room. Runabout trout cabin is very private and the view was awesome. The beds were actually comfy most cabins we have rented before the mattress was horrible.....great getaway but close enough to stores to get ice and extra bread. We had a great time. This is the second time we have stayed in the Run About Trout Lodge., and we will be staying there again next year. We love time! It is nice and clean and very comfortable. Thank! We have had a great two-week holiday. The cabin is in a perfect location for us. Close to everything we like to do. We loved being close to the river & seeing the train go by. Enjoyed the stay. Very relaxing. This is our second time booking a vacation property through Mountain Laurel Rentals. Stayed at Nanny's Shanty last time but needed more space this time. Both times your team members were extremely helpful but we especially liked not having to check in at your office ... just using the door code this time. From beginning to end, our vacation experience was wonderful. Our crew spent hours just sitting relaxing by the water, fly fishing, and waiting for our rafters to show up after 2-3 hours of drifting. The pavilion by the river was a great place for a big breakfast one morning and low country boil one evening (cooked on our camp stove). The deck was spacious and a good place to wave to the train when it came by (our one year old grandson's favorite). The kitchen was spacious and well equipped. The bedrooms were comfortable with lots of storage. We also enjoyed the hot tub (especially after rafting) and pool tournaments in the bottom level. Most of our group enjoyed ziplining close by one morning. There was definitely something for everyone. Suffice it to say we didn't want to leave and can't wait to get back up that way. The team was always helpful and answered questions courteously and honestly. We all agreed that the house and property was beautiful. The master bedroom and bath is very nice. Maybe a couple of more outside trash cans would be helpful for large groups who like to cook. Our son is leaving in two weeks to go to the Air Force Academy. We planned this last minute trip to the mountains/river for him. We could not have asked for a more perfect mini trip... EVERYTHING was perfect! Such sweet memories were made... We hope to be back! They were most helpful. Thank you all very much. Loved it, we saw snow flurries and that was a big deal for us. We'll be back! We had a wonderful time not sure how many trout we caught, but well over 20 with the biggest being 23 inches and about 6 or 7 pounds. We also caught a 15 inch native brook trout and a 13 inch brown trout. We also saw deer and turkeys. We will be back next year! Secluded but not too far from town. The view of the rive and the outside fireplace added to the experience. Great stay!